In the broadest sense, compost is the biological reduction of organic waste into humus, which is an ‘earth-like’ substance that makes a great fertilizer, soil amendment, and most importantly, builds good soil structure. Compost is the best recycler of organic wastes, turning millions of tonnes of our refuse into a food-growing asset. Recycling garden and food wastes is important to a good environment because it is a natural process. Waste can be disposed of by chemical means (burning), or by largely physical means (landfilling), but only when it is disposed of by biological means (composting) are plant nutrients conserved to the advantage of the entire ecosystem. 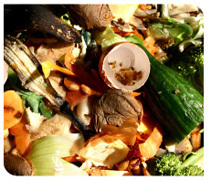 Resources are conserved by returning wastes in the form in which they can be most efficiently used – compost. Compost can be rich in nutrients. It is used in gardens, landscaping, horticulture, and agriculture. The compost itself is beneficial for the land in many ways, including as a soil conditioner, a fertilizer, addition of vital humus or humic acids, and as a natural pesticide for soil. In ecosystems, compost is useful for erosion control, land and stream reclamation, and wetland construction. Making your very own compost is easy to do! Backyard composting is a great way to turn kitchen waste and yard waste into a rich soil conditioner. Compost can improve the soil in your lawn and add nutrients to your garden and plants. Backyard composting is easy. You don’t need any special knowledge or equipment, and it takes only a little extra time to collect the organic waste from your kitchen and yard to establish a compost pile. Establishing a compost pile can be accomplished in a number of different ways. Homes or farms that are situated on large acreage can establish a ‘pile’ in any sunny location. However, most suburban homes will utilize a backyard composter that has either been built or purchased. Carbon — for energy; the microbial oxidation of carbon produces the heat. High carbon materials tend to be brown and dry. Nitrogen — to grow and reproduce more organisms to oxidize the carbon. High nitrogen materials tend to be green (or colourful, such as fruits and vegetables) and wet. Certain ratios of these materials will provide beneficial microorganisms and bacteria with the nutrients to work at a rate that will heat up the pile. In that process much water will be released as vapour (“steam”), and the oxygen will be quickly depleted, explaining the need to actively manage the pile. The hotter the pile gets, the more often added air and water is necessary; the air/water balance is critical to maintaining high temperatures until the materials are broken down. At the same time, too much air or water also slows the process, as does too much carbon (or too little nitrogen). 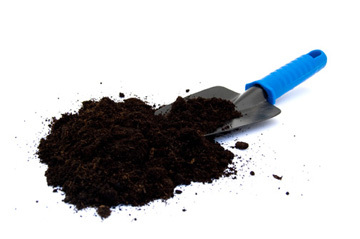 The most efficient composting occurs with a carbon:nitrogen mix of about 30 to 1. Nearly all plant and animal materials have both carbon and nitrogen, but amounts vary widely, with characteristics noted above (dry/wet, brown/green). Fresh grass clippings have an average ratio of about 15 to 1 and dry autumn leaves about 50 to 1 depending on species. Mixing equal parts by volume approximates the ideal C:N range. Few individual situations will provide the ideal mix of materials at any point in time; in this respect, home composting is like horseshoes, perfect is great, but close still works. Observation of amounts, and consideration of different materials as a pile is built over time, can quickly achieve a workable technique for the individual situation. What Does A Backyard Composter Require To Work Properly? Think of a composter as a living organism. It requires food, water and air to work. If a proper balance of these three components is achieved, the materials will rapidly break down. Food: The fastest way to produce compost is to use a balance of carbon (brown materials) and nitrogen (green materials). A good ratio is two parts brown material to one part green material. Brown material is any type of organic waste that does not have a significant amount of water content such as: dry grass and leaves, sawdust, dryer lint, etc. Green material is wet organic waste such as fruits and vegetable rinds. Layering brown and green materials is useful, but a complete mixing of ingredients is also acceptable. Water: Keep the composter wet like a damp, wrung-out sponge. If the pile is too wet, turn it and add a few branches to help the flow of air. If it’s too dry, add water. Air: The microorganisms in your composter need oxygen. Turning the compost pile every two or three weeks lets oxygen into the pile and will speed up the decomposition process. Cold weather composting: You can compost year round. The composting process simply slows down in the colder months; but the centre of a compost pile usually works, even in the coldest months. Where Can Backyard Composters Be Purchased? Backyard Composters are available at all Home Hardware stores in the City of Windsor and Essex County for $35.00 (taxes included – prices subject to change without notification). Look for the location nearest you. Backyard Composters are also sold at EWSWA Truckload Sales. Visit ‘Upcoming Events’ under the Education & Resources section of the website for information regarding the next Truckload Sale. Backyard Composters are also available on-line in a variety of styles and sizes. 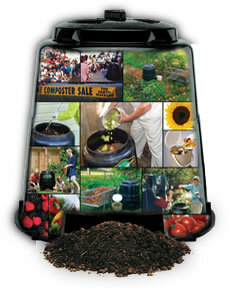 A good selection of Backyard Composters can be found at Composter Guide. Please note that the link is for a U.S. site. Compost Turners (or Aerating Tools) are able to turn compost without resorting to the traditional back-breaking job of removing and reloading by shovel or pitchfork. Simply plunge the Compost Turner into the compost pile; as it is withdrawn, the heavy-duty blades open to aerate and turn the compost. USAGE: Plunge turner into the composter then pull up. The two hinged “wings” open out. Push and pull to lift, mix & aerate material within the pile. The EWSWA sells a compost turner /aerator at the Truckload Sales. You can also purchase one on-line from Lee Valley Tools at Lee Valley Website. Many individuals enjoy the challenge of building their own backyard composter. Below are instructions for building a wood and wire composter.